About 15 percent of your body weight is skin. If that seems like a lot, remember that skin is your largest organ. And one of your most important. Understanding your skin’s structure is the first step to maintaining the health of your armor against the outside world. Your skin comprises a large portion of the integumentary system. This organ system also contains hair, nails, and glands that produce sweat and oil. The three main functions of the integumentary system are protection, regulation, and sensation. Skin’s primary function in this system is to act as a barrier. It provides protection from various environmental elements—temperature, bacteria, chemicals, the sun, and more. But the blood vessels in the skin also help it regulate your body temperature. And skin is where your body uses sunlight to manufacture vitamin D.
Your skin performs a lot of important functions, and each of its three layers play a role. 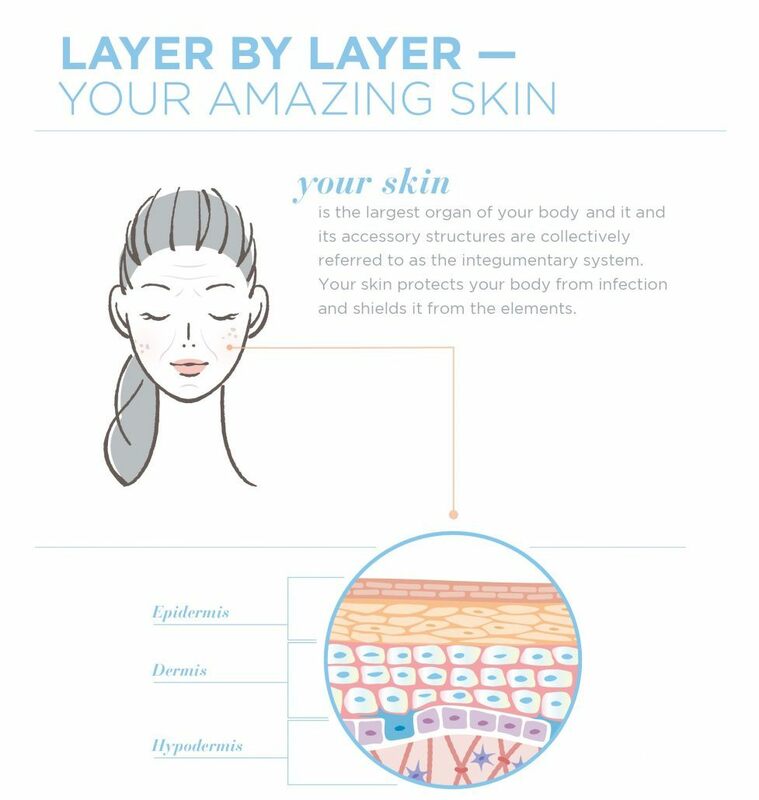 The epidermis is the top layer of your skin. It’s made up of millions of skin cells held together by lipids. This creates a resilient barrier and regulates the amount of water released from your body. The outermost part of the epidermis (stratum coreneum) is comprised of layers of flattened cells. Below, the basal layer—composed of proteins in column-like arrangements—makes new skin cells. That’s because this layer is the only one of the epidermis’ five parts that perform mitosis (division of the cellular nucleus). So your older skin cells flake off the very top layer, and the newer ones push up from the basal layer to take their place. Your epidermis contains four different types of cells. The majority are keratinocytes, which form your water-proof, protective barrier. Melanin—or skin pigment—is produced in the epidermal melanocytes. Langerhans and Merkel cells deal with immune response and sensation, respectively. The next layer of skin is the dermis. It lies beneath the epidermis, and is responsible for a variety of functions. This layer contains hair roots, nerve endings, blood vessels, and sweat glands that help regulate body temperature and remove waste products. The dermis also contains oil (sebaceous) glands that keep your skin looking soft and smooth, but also help with waterproofing. Your dermis has two parts—papillary and reticular. The papillary dermis contains the interlocking connections that help supply blood and nutrients to the epidermis. The reticular dermis is the thicker, deeper portion that contains building blocks like collagen and elastin which give skin its flexibility and strength. 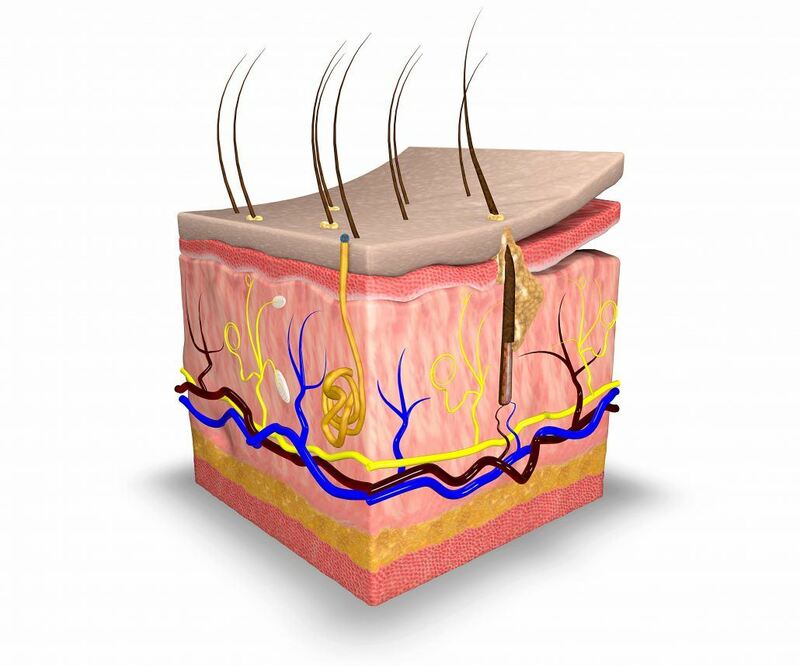 Your hair follicles and glands also reside in the reticular dermis. The subcutaneous tissue is the lowest layer of the integumentary system. It’s used mainly for fat storage. The hypodermis contains the connective tissue that attaches the dermis to your muscles and bones. It also provides support to the blood vessels, nerves, and glands in the dermis. Learning these basics will help you gain a greater understanding of how to take care of and maintain your skin properly. Now that you know the basics of your skin’s structure, learn more about the important role nutrients play in healthy-looking skin.